2. Learn about "guitar language"
4. Your first chord "E major"
Imagine the next time someone asks you to pick up the guitar at a family gathering and NOW you can play songs everyone knows and enjoys with ease and confidence. You'll be the star at the party and everyone will love you for it! After you enroll in this course, you won't need to imagine anymore. I take you step-by-step and note-by-note through all the elements needed to make this a reality in a very short amount of time!!! 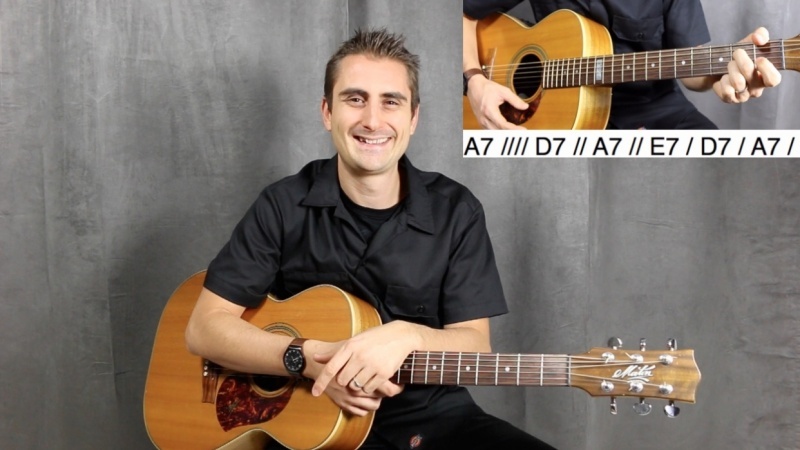 Every song lesson comes with a play-along feature, so after you´re done learning the song, I play it with you at a slow and comfortable tempo, and you´ll always have an easy time putting it into practical use. The course also comes with a 42 page picture chord book, so you´ll have a easy time following along with all the lessons. This method has WORKED on thousands of students and I know it will work for you! Become the guitar player you´ve always dreamed of being and ENROLL NOW!!! Here are what some of my students have said in the past! "Just amazing, Cant ask for more simple and easy step by step learning. I found this course! Thank You sir!" "I have just completed this course and would comment accordingly. certainly a beginner, to work through this course. Thank you, Will." Henry Olsen is a self-taught professional guitarist with 13 years playing experience and 4 years professional teaching experience. He provides one-on-one private guitar classes in Austria and offers online guitar courses - both free and paid - to students who sign up on his website. He also has a constantly expanding YouTube Channel with over 6000 subscribers.